Lexie Officer, a sophomore at Ponca City Senior High School, has been selected as the “Wildcat of the Week” for the week of Jan. 28-Feb. 1. “Through the best of times and the most challenging of times, Lexie can always be found with a smile on her face,” Superintendent Shelley Arrott said. “That smile is highly contagious to her teachers, classmates and friends because whenever Lexie is around, others smile, too. Po-Hi Principal Thad Dilbeck and Superintendent Arrott presented Kaylee a “Wildcat of the Week” T-shirt from Boss Custom T-shirts, a Wildcat window decal, and a burger basket gift certificate from Ground Round. The “Wildcat of the Week” Award is sponsored this year by Heather Cannon Honda. The award is for a deserving high school student who follows the characteristics of the Wildcat Way, which are Work Ethic, Improvement, Leadership, Discipline, Compete, Attitude, and Teamwork. These characteristics may be exhibited in any setting and is open to all Ponca City High School students. 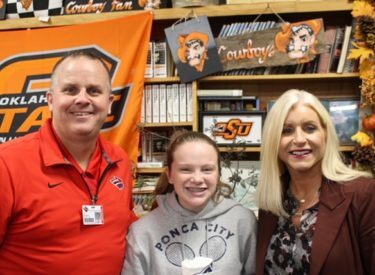 Several Ponca City patrons are involved in making the “Wildcat of the Week” a reality. These partners include: Tina Christian, Sen. Bill Coleman – TEAM Radio, Heather Cannon – Heather Cannon Honda, Ground Round, and Tyndall Dentistry. Each week a new “Wildcat of the Week” will be selected from the nominations of TEAM Radio listeners and viewers. Winners will receive a free meal from Ground Round and a T-shirt from Boss Custom Tees. PCPS will make the presentation weekly at Po-Hi. If you know an outstanding student at Po-Hi who is living the Wildcat Way, follow this link: Wildcat of the Week Nomination Form or visit www.PoHISports.com, or www.pcps.us.